I don’t recall ever having started a review by saying you should pretty much ignore my verdict. Call this page a special “collectors edition” if you like, but the opinions that really matter aren’t mine: they belong to the two Junior Diners we took to lunch. You see, it’s the summer holidays which, if you’re young enough still to be on the receiving end of a school education, stretch out in front of you like a delightful dream. For parents, however, it’s a never-ending dilemma of how to keep kids amused. Apart from developing urchins into citizens and all that jazz, the real purpose of school is to provide free childcare. When it stops, your world is turned upside down, and anything that the whole family can enjoy together suddenly become wildly valuable. 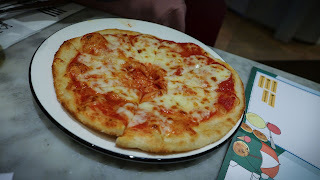 So, having been entrusted with Mrs Diner’s London-based nieces, aged 10 and 5, for an afternoon in the city centre, they enthusiastically accepted the suggestion of a trip to PizzaExpress. It’s more years than I care to remember since I stepped inside a PizzaExpress. 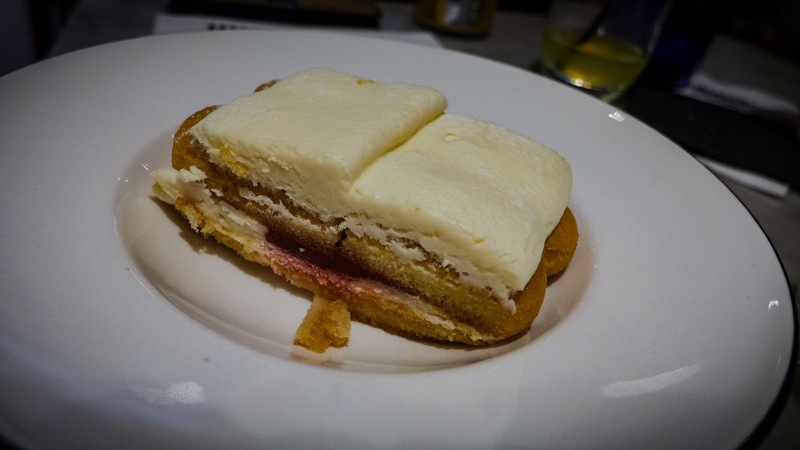 When I worked in London, I spent many pleasant evenings in their basement jazz club in Dean Street, or on the pink velvet banquettes of Kettners, then the most upmarket PizzaExpress in the UK, with its grand piano and champagne bar. That’s where Peter Boizot, the immaculately besuited founder of the chain, held court. 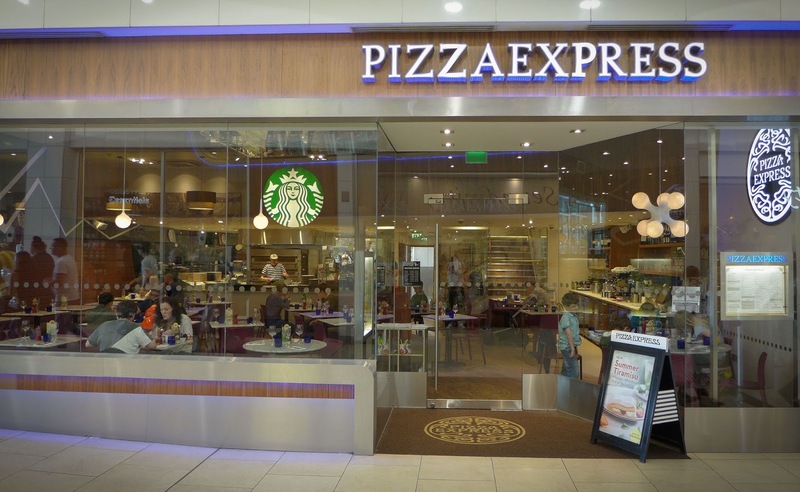 Since those early days, PizzaExpress has expanded beyond recognition and changed ownership several times. 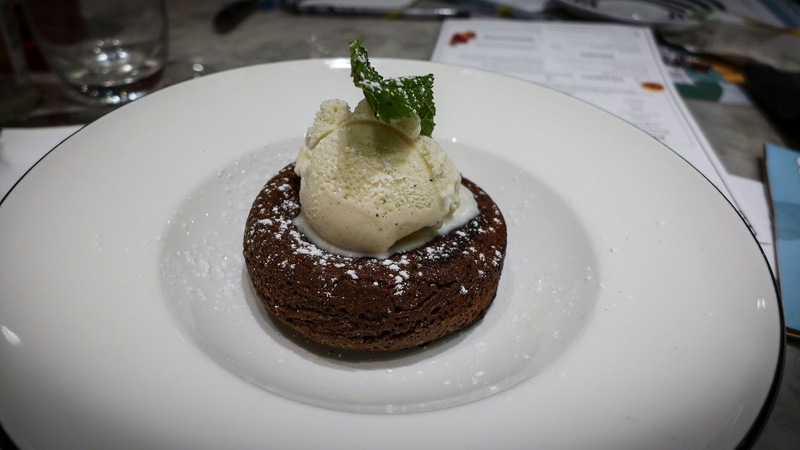 It’s now the place to come with your kids; parents can down Peronis and indifferent but cheap red wine whilst their brood cover themselves in chocolate fudge cake. A divorced friend of mine says it’s like Custody Central at weekends. 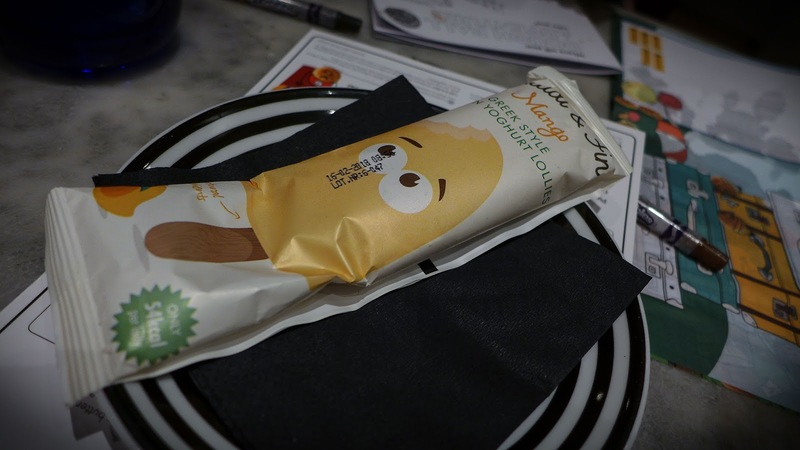 The chain last changed hands for £900million, so it must be doing something right, but it must also be ten years since I sampled its carefully portion-controlled menu. 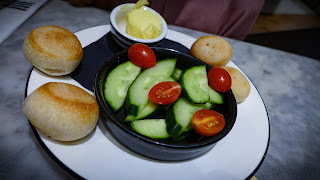 Luckily, it turns out my London nieces are PizzaExpress afficionados, taking up their “Piccolo” menus - £6.95 for three courses - with an authoritative familiarity that I found impressive. While Mrs Diner and I scanned the oldster menu at length for things that offered some reason for optimism, they were way ahead of us. They each started with a plate of dough balls, which they had to seeing as it was the only starter available to them. “They’re nice and soft,” said the elder child, studiously avoiding the chopped cucumber and cherry tomatoes that sat alongside them. I tried one. She was right, they were soft. Soft and doughy, and a tiny bit garlicky when smeared with their allium-tinged butter. They got 5 stars, reduced to four after some serious reflection because “there ought to be more choice for us kids”. Quite right. 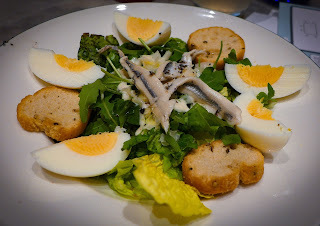 Meanwhile, I ploughed through an enjoyably hopeless Caesar salad featuring mostly undressed rocket, croutons that looked like they came out a packet of budget health snacks, and “Gran Milano” cheese. I’ve never heard of Gran Milano cheese. Perhaps PizzaExpress invented it? It was Parmesan-esque, so maybe it was Grana Padana, only not as grainy, and from Milan. It certainly wasn’t great. 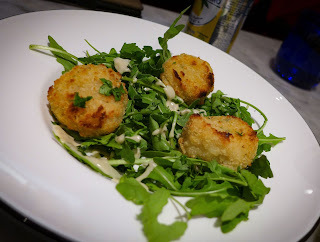 Mrs Diner’s Cod Crocchette consisted of three dinky crumbed and baked balls of fish, with more rocket, and represented dubious value at £5.95. It was time for mains, and things got exciting as there were choices to be made. The youngest certainly knows her own mind; she wasn’t going to budge from cheese and tomato pizza, and why should she? She's got her whole life ahead of her to muck about with toppings. 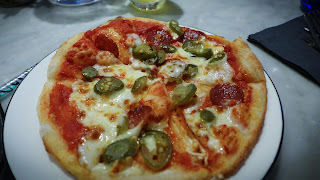 The ten year old, feeling brave, requested jalapenos on her American peperoni (the American Hot is one of PizzaExpress's most popular varieties). Both Piccolo pizzas scored a solid 5 stars, which I would take issue with, but then that’s not the point, is it? “So they were perfect, were they?” I enquired. “Nice and soft”, came the answer. Clearly softness is a quality that the youth of today particularly value. Mrs Diner’s seafood rigatoni was unenjoyably hopeless, devoid even of any ironic pleasures. Gummy pasta - and not even much of it - was dressed in a weird sauce that tasted a bit like watery canned soup. 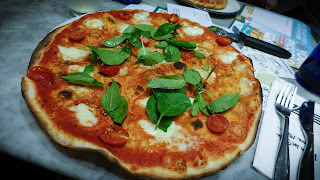 My Margherita Bufala pizza on a thin, “Romana” base was a good deal less grim, although still a biscuity affair featuring fairly flavourless buffalo mozzarella and an underperforming tomato sauce. 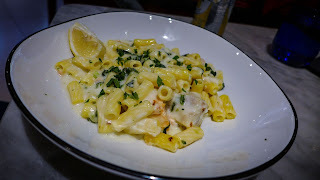 The dominant flavour was that of the raw basil leaves scattered over the thing. The dough tasted like it had been prepared far away, and some time ago. 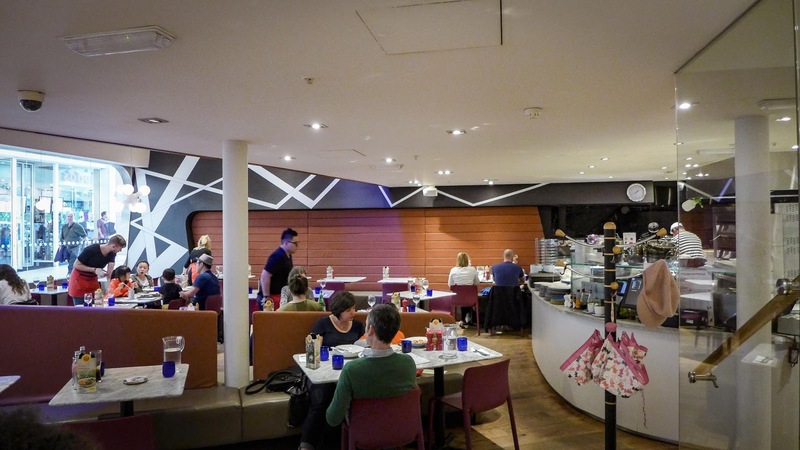 PizzaExpress prides itself on never having changed its values since those first branches opened in London in 1965. I wondered if that included its dough recipe. Apparently it ensures consistency by preparing the stuff centrally and shipping it out to its branches. Herein lies a problem - the consistency. Back in the sixties, British people wouldn't recognise a decent pizza if it hit them with an oven paddle singing O Sole Mio. Now the country is packed with places making their own dough (like Cal's Own and The Wood Oven, amongst others), baking them quickly and crisply in 450°C wood-fired ovens, some even imported from Naples, with proper tomato sauce made from San Marzano tomatoes. There's a whole different standard around, and PizzaExpress, with its soggy (or "soft", as the kids call them) pizzas have been left behind. Which it's why it's great for kids, and a disappointment for anyone who knows their pizza. Mrs Diner completed a clean sweep of duds with her “Summer tiramisu”, a sad little square of tight, dry sponge fingers topped with dense mascarpone, fetched and plated to order from a plastic container in the open kitchen. Not so much a pick me up as a put me down. My chocolate fondant was comparatively successful on account of having a molten middle and being crowned with a scoop of decent ice cream, although it managed to somehow taste of not much cocoa. Never mind, the kids menu hit the jackpot again with its offer of mango yoghurt ice lollies. You guessed it: 5 stars! They also wolfed down my “chocolate goo” in between licks and declared the whole meal a roaring success. In short, they loved it, while Mrs Diner and I have had worse meals, though admittedly not that many. We spent a bit over sixty quid, but could have done it much cheaper if we’d been organised and printed out some vouchers. The place was fairly packed with families of various shapes and sizes, and no wonder: it’s a 5-star rated restaurant. For some of the customers at least. 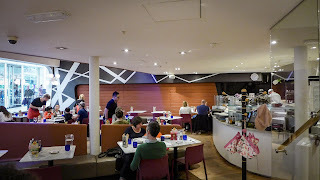 *Junior Diner, who's just read this, says I completely missed the real reason she loves Pizza Express, apart from the pizza and the chocolate pudding: it's the free balloon she gets at the end. Silly me.